I’ve played more For Honor over the past week than any game in recent memory. Just like Ubisoft’s other habit-forming multiplayer game, Rainbow Six Siege, For Honor takes a different tact to its competitors and delivers something unique and thrilling. But it isn’t perfect. Far from it. It’s had the worst AAA launch of the year so far, showing that sometimes an open beta is more useful as an advertising tool rather than an exercise in finding holes in the ship to patch up. When it works, For Honor is an unmissable adventure into a fictional world where people kill each other more than they use syllables. When it doesn’t work, which is often, it’s risking its own longevity. It’s hard to see For Honor (as good as it is) lasting for years and years, so to see it already endangering itself at such a young age is worrying. It’s not just the game’s performance that needs addressing, either. For Honor could be winning awards come the end of the year, but unless the following is seriously looked at by Ubisoft, there’s little chance of that happening. Much has been made of Ubisoft’s decision to go down the P2P route for PVP and it’s a choice that isn’t working out at all. Both my colleague James and I have had constant issues trying to connect to multiplayer matches, and an even higher amount of matches have some kind of connection. For Honor is a game about finesse and skill, so it simply won’t do to have a duel broken up by repeated synchronisation failures. Sadly, as it’s such a big part of the infrastructure of the game, ditching P2P for dedicated servers is unlikely to happen. Ubisoft now have a job on their hands to try and put out fires wherever they can and find a long-term solution, especially if the game has any aspirations of following Siege and becoming an eSport mainstay. I was three days late to the For Honor party and I already feel like I missed too much to make it any further than averageness. Although my K/D isn’t exactly terrible, I’m regularly being paired up against players who live and breathe fantasy warfare. The results are almost always ugly. Add to that an almost impenetrable wall of microtransactions and you might be forgiven for not wanting to spend money on a game to be asked to spend more within the game itself. It isn’t exactly pay-to-win, but For Honor’s menus give you constant reminders that you can unlock more steels and all feats without having to put in the time. It’s a brash deterrent. It’s not uncommon to find yourself locked in a duel, blink, and then find that you’ve died. While some of this comes to down to you being a scrub, an even larger aspect to consider is the gear system that allows certain heroes to become mercilessly overpowered. With the right gear, guys like Lawbringer can hit Revenge mode within a second, unleash their unstoppable combo, and you’re done. Not only does this mean that lower level players are going to be in for a rough ride, but it also turns the game into repetitive and gimmicky battles, which is hardly boasting the dynamism its developers were pushing. Worse still, you can spend real money for more steel to upgrade your weapons. Even if this only creates a small boost for the opposition, it creates an imbalance in a game where the tiniest event can mean life or death. This makes no sense to me and never has: instead of being two separate modes, you can only specify a preference to play either Elimination or Skirmish as they are (for some reason) lumped together. Skirmish is unfulfilling and flat, but Elimination can be a twitchy, enthralling experience that can leave you breathless after a close duel or two. So why are they combined? 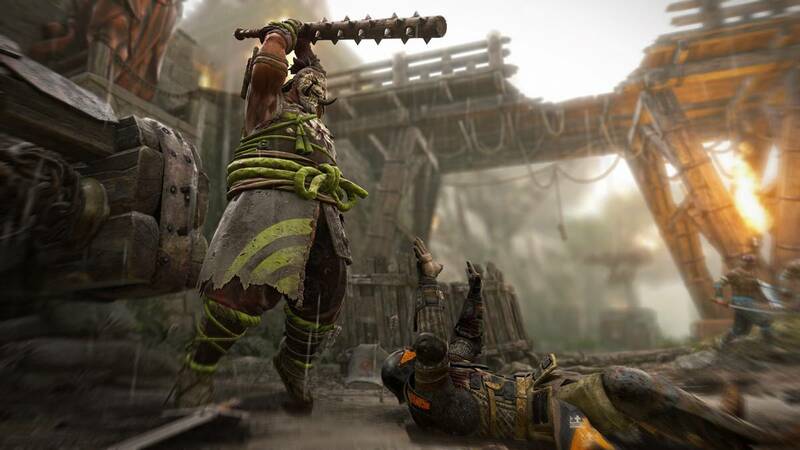 Perhaps knowing that Dominion would be the go-to for most players, Ubisoft wanted to “shrink” the rest of the playing field and improve the chances of other modes being played. However, if anything, it’s had the opposite effect on me – I have no desire to try my hand at Elimination in case I end up falling asleep during a forced round of Skirmish instead. Even though I’ve played a lot on my own, I’ve sometimes taken to the battlefield with Alex Davies, another writer here. Before a match began, he asked me if I’d sorted out my daily orders. I scoffed and told him that I don’t bother with it. The reason is simple: few of the orders apply to me and what I like to play. They are seemingly there to try to attract people to the other modes and away from Dominion. This would be fine, except Skirmish and Elimination are glued to each other and just aren’t as much fun as most people’s preferred mode. Getting extra XP and some more steel as a reward for sitting through the inconsistent connections for minutes on end and hoping that you don’t get kicked on the lesser modes doesn’t seem worth it. They're also donating €500,000 to support the restoration.